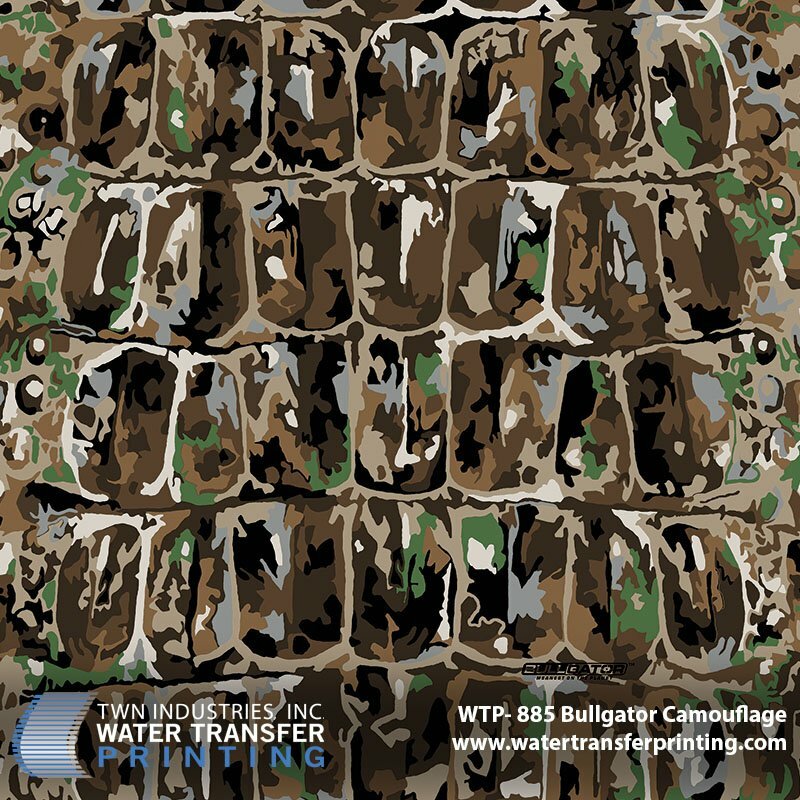 Princeton, FL – October 18, 2016 – TWN Industries Inc., the leading Water Transfer Printing supplier is happy to announce its new BullGator Camouflage hydro dipping film. BullGator Camo is a unique naturally occurring non-stick and leaf pattern that has both micro and macro elements. It is taken directly from one of the world’s meanest and only remaining prehistoric predators, the American Alligator. BullGator’s unique blend of colors, shapes and sizes allow it to be incredibly effective camouflage in a multitude of environments whether it be in the wooded Eastern US, Northwestern US, the Rocky Mountains or the sandy desert of the Southwest. It is extremely effective on the ground or in a tree. Not only is it great camouflage but it is extremely visually appealing to both the hunter and non-hunter. We sat down with Tom Martin, CEO of BullGator Outfitters and asked him a few questions about the pattern and the company. What type of hunting can BullGator be used for? Currently, hunters are using BullGator Camo for whitetail, turkey, hogs, bear, elk and sheep in multiple states including Florida, Georgia, Alabama, Kentucky, Wisconsin, North Carolina, South Carolina, New York, New Jersey, Nevada, Colorado, and Wyoming. It is also worn as leisure clothing. What makes BullGator Camouflage unique? The American Alligator, a pinnacle predator, has survived for thousands of years, not only because of its strength and stealth, but because of its incredible camouflaged skin pattern. The pattern is unique because it mimics the naturally occurring camouflage of the American Alligator, resulting in the best and most versatile camouflage ever. Try to find these hunters wearing BullGator Camouflage! How was BullGator Outfitters Born? After alligator hunting for several years my family and I realized how incredibly camouflaged they were, both in and out of the water. The young ones particularly had a pattern and color variation that made them next to impossible to see in their natural environment. This led to many campfire discussions about different types of camouflage and ultimately the idea of creating a pattern based on alligator skin was born. What does the BullGator Outfitters brand stand for? What is the company culture? The BullGator brand is built for the everyday person who enjoys adventure. We built our brand on 4 key principles: faith, family, freedom and the great outdoors. The culture of our company is one of a positive, can do attitude that is fueled by our love for the outdoors. We would like company to be recognized for its values along with the strength and fearlessness of the American Alligator, one of the meanest predators on the planet. BullGator is a natural animal based micro and macro pattern, allowing it to blend into most all environments. The “earth toned” color scheme features mostly tans and browns with a touch of grey and green. This makes it extremely effective not only in South and Eastern forest terrains, but also in the Rockies as well as the arid Southwest. BullGator Outfitters was founded by the Martin family in 2013. Tom & Sally Martin along with their son, John and daughter, Monica started BullGator Outfitters as a result of their love for hunting and fishing. Always looking for a new adventure, the BullGator team began alligator hunting in 2004 and quickly became obsessed with the American Alligator, especially its effective camouflaging mechanisms. Being an entrepreneurial minded family, the idea of starting a company with a camouflage pattern based on the American Alligator came natural to Tom and Sally. In 2011, they started experimenting with different designs, but it wasn’t until 2013 when they came back to the original alligator pattern and developed the final design. Thus, BullGator Camo, Meanest on the Planet, was born. 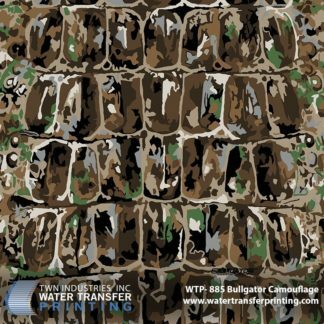 BullGator camo is currently licensed by the Meyerco corp, making backpacks and bags, CKK Industries making kydex for holsters, and now TWN, Industries, Inc. for hydrographic film. They are widely involved in the camouflage and hunting industry, sponsoring groups including Swanson Media Group, The Turkeyologist, Busted Rack Outdoors, and The Veteran Predator Hunters, a non-profit organization run by retired military veterans who help acclimate post 9/11 veterans to normal life by using hunting as therapy. Visit BullGator Outfitters for more information.